A mouse cursor is an object you can use on any slide to depict a moving mouse effect. If you like, you can also include a mouse-clicking action and sound. 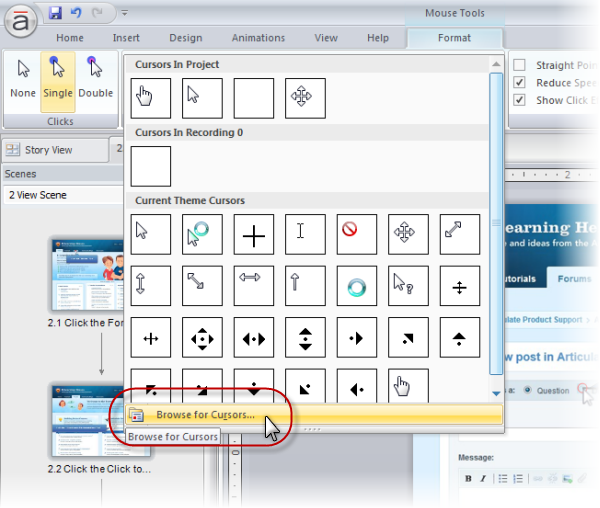 Mouse cursors are an easy way to enhance courses that include demos of software or web-based applications. You can insert them manually via the Insert tab on the Storyline ribbon. This is handy, for example, when you're using your own screenshots to build a software demonstration. 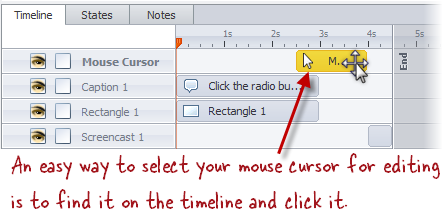 You can have Storyline insert mouse cursors for you automatically as part of a screen recording. Any time you create a screen recording in Storyline and insert it as Step-By-Step slides with View Mode Steps, Storyline inserts a mouse cursor object on the appropriate slide to show mouse movements from your recording. You can customize any mouse cursor, whether you've inserted it yourself or Storyline inserted it as part of a screen recording. For example, you can swap it for a different cursor style, customize the direction of the mouse motion, or change or remove the clicking sound or effect. Each slide can include one mouse cursor on the base layer of the slide. It's not possible to add multiple mouse cursors to a single slide, nor is it possible to add mouse cursors to slide layers other than the base layer. Go to the slide where you want to insert a mouse cursor. Click on the style you prefer. Storyline inserts the mouse cursor object on your slide. Now you can customize it as you like, using the options described below. Or, click the small arrow on the cursor styles to expand the list of choices, and then choose Browse for Cursors: This allows you to choose from any of the default Windows cursors available on your system, or to browse for any other file with a .cur or .ani extension. Select the mouse cursor on your slide. By default, in your published course Storyline applies a mouse-click effect (a small animated circle) at the point when the mouse clicks. If you'd rather omit the click effect, just select the mouse cursor on your slide, click the Format tab, and unmark the box next to Show Click Effects. Mark the Straight Pointer Path box if you'd like the mouse path to be straight rather than curved. Use the Enter From selector to choose from eight entrance points. Note: If the Enter From selector is grayed out, it's because the path direction is already determined by the previous slide. When you have multiple consecutive slides with mouse cursors, the end point of the first will be the beginning point of the next. When a slide contains a mouse cursor object, the mouse stays on screen for the duration of your slide. You can, however, use Storyline's timeline to change when the mouse motion starts and ends. (Unlike other objects, for mouse cursors, you use the timeline to control the beginning and end of the cursor's motion - not the appearance and disappearance of the cursor itself.) You can also choose to make the mouse motion slow down before the click. On the timeline, select the Mouse Cursor object. Hover over the left border of the object until your cursor changes to a double-headed arrow. If you want the mouse cursor to slow down a little bit before the click action, mark the box next to Reduce Speed Before Click on the Format tab.